The client’s wish -‘No garden!’- led to a unique solution. Seen from the street the villa rises ominously from the earth, its slanting roof plane coated with black gravel. 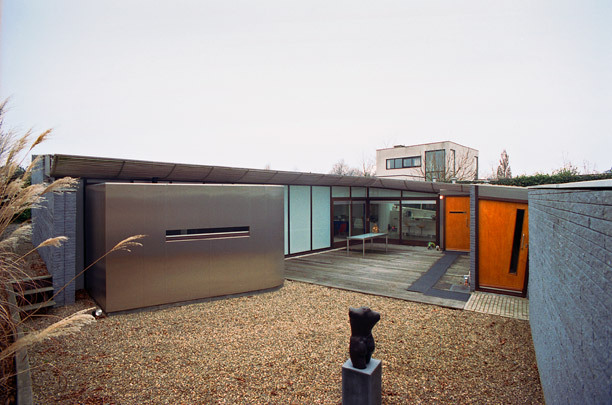 Hewn from its oblique volume are the garage entrance and a patio, around which is draped the L-shaped dwelling. The monolithic look of the whole is due to the bricks being directly agglutinated in stacks rather than divided by mortar joints in courses. Walls, windows and frames placed obliquely and differences in level engage naturally in Van Berkel’s customary game of upright and tilting volumes.